Try adopting these habits to make it possible for you to exercise on a daily basis. If you ask most busy people why they do not exercise, by far the most common reason is that that they “don’t have time.” The effort of putting on workout clothes, going to the gym, and showering is simply too onerous to fit in. Even the idea of a boring home workout or a 30-minute exercise tape can feel like too much of a commitment when we are late for work or for a date. A few years ago, I finally realized how crappy I felt when I hadn’t exercised, and I resolved to find some way to ensure I was at least getting some exercise every day—even when I couldn’t make it to the gym. The result was a series of small habits that I can work into my existing day without having to carve out any additional time for a workout. These habits have made it possible for me to exercise daily while still spending 60 to 80 hours per week. Rather than doing your meetings over coffee, why do not you invite people to go for a walking meeting? Steve Jobs, Winston Churchill, and many US presidents have been huge advocates of this practice for both health and camaraderie purposes. Even if you are just taking a phone call, use it as an opportunity to take a walk around the block or to your next destination. Waiting for the subway? Do some calf raises. Afraid someone’s watching? Do toe lifts—they are more subtle and work your shins. Having 30 seconds to kill is a great cue to kick off a mini-exercise. 4. Exercise while brushing teeth. You probably already spend one to three minutes brushing and flossing your teeth at least once a day. Why not brush your teeth while holding a deep squat, or while doing side leg lifts? These things are perfectly doable and add no additional time to your tooth-brushing activities. Simply tell yourself that you have no excuse for brushing your teeth without holding a deep squat. No matter how tired you are. 5. Exercise while watching TV. This does not just mean to put a treadmill in your living room—although that does help for some people. You can do nearly any exercise while watching TV and even make a game out of it: “I’m allowed to watch another show if I do 50 push-ups.” You should be earning the right to watch that trashy reality show. 6. Exercise at your desk. Rather than resigning yourself to the fact that sitting is slowly killing you, you can take advantage of your desk time by doing toe raises, arm circles or wrist stretches. You could even do squats or lunges while taking a break or listening to a webinar. Office job does not have to mean sedentary job. 7. Exercise at a traffic light. When we are stuck at a light for a few minutes, our first instinct is often to check our phones. That is dangerous—and in some places illegal. Why not keep some hand weights in the console, so you can work out your grip whenever you find yourself idling? 8. 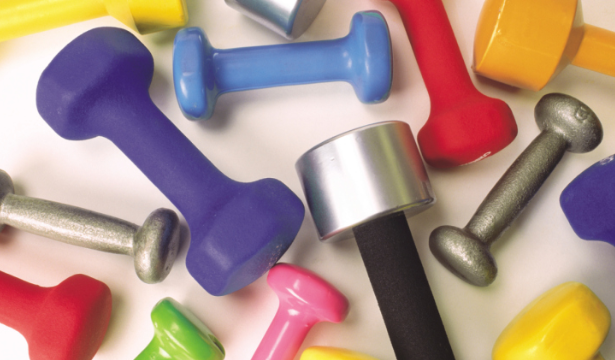 Actually carve out 7 minutes of your day to exercise. I have recently been using an excellent iPhone app called 7-Minute Workout, which has totally changed my life. It is a simple, voice-guided power workouts that make it easy to exercise in my bedroom using only my body and some basic props, and the app’s game mechanics help make the experience fun rather than a chore. The best part is that, no matter how busy I am, I always have time for a 7-minute workout. I’m currently rocking a 3-month daily workout streak and counting. These small exercises may sound like a lot to remember, but you can just start one-at-a-time until each thing becomes a true habit. The trick is to associate exercises with mini-cues. Tell yourself that “If I take the elevator three floors or lazily brush my teeth without squatting, then I'm missing a huge opportunity for growth.” Once you have internalized these habits and associated them with a cue, you would not really have to think about exercising at all. It just happens.